Opening Sentences: In the darkness something scuttled. The girl shivered in the chilling damp of the small room. The dead grey stone of the walls seemed to drain the warmth from her body. Even in her heavy velvet gown she felt naked, exposed, vulnerable. Book Synopsis: Artist Laura Matthews finds her new home in the Welsh mountains to be a place so charged with tales and legends that she is able to reach through the gossamer-fine veil that separates her own world from that of myth and fable. 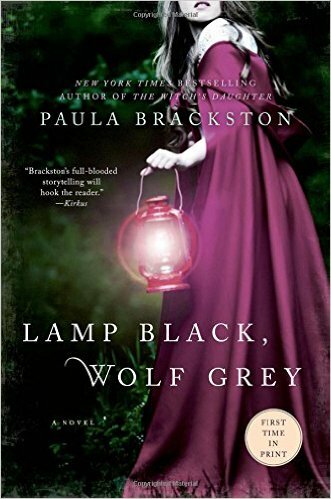 Lamp Black, Wolf Grey is a blend of gothic, romance, time-travel, and mystery. Laura is a character of current day whose life becomes intertwined with that of a 13th century young woman named Megan. Merlin of King Arthur's era also is a prominent character in this novel. Set in an ancient croft in the mountains of Wales, the atmospheric, almost haunting tone with plenty of secrets, permeates each page. The author writes in a compelling way striking a good balance between description and pace. She skilfully evokes the mystical history of Wales as a backdrop for a tale filled with passion that does not shy away from a bit of violence and gore. For readers who like elements of fantasy weaved into their historical fiction, this one should definitely satisfy.